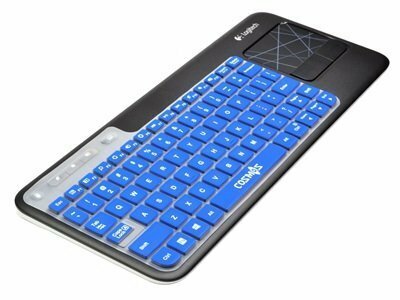 Home › Electronics › Cosmos Ultra Thin Silicone Soft Keyboard Cover Skin For Logitech Wireless Tou..
Cosmos Ultra Thin Silicone Soft Keyboard Cover Skin For Logitech Wireless Tou.. Equipped with a numeric keypad and special function keys printing especially for Logitech keyboard K400 or K400r, please note it is NOT for Logitech Wireless Touch Keyboard K400 Plus. Color: Blue Keyboard Cover This keyboard cover is perfect for Logitech keyboard K400/K400r. Keys withletter and numeric printing makes you typing easily. Washable and very longlasting. Cosmos is a registered trademark USPTO serial: 85-390,937 protectedby US Trademark Law, all products by Cosmos are exclusively distributed byCosmos Tech & Leisure.